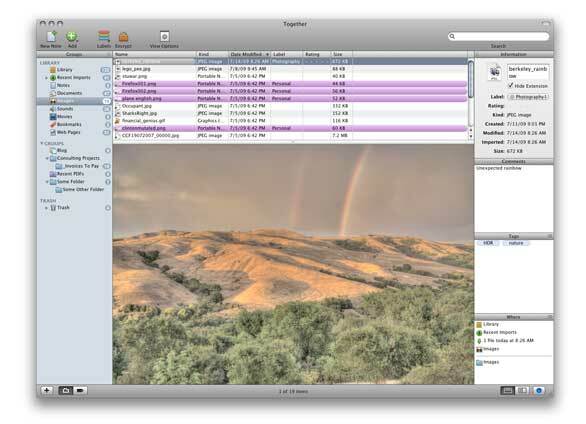 Together 2.2 from Reinvented Software is an application for keeping disparate bits and pieces of digital data organized and manageable. Mac OS X’s built-in Spotlight, with its content indexing and plug-in architecture do a fine job of helping track down just the item you need, but Together’s abundant management and categorization tools handily justify the asking price. Modeled in the visual style of iTunes ( ), Together (which was formerly called KIT) displays a sidebar down the left side of the window containing the library—the place where all items are stored—and various groupings of those items below. Getting existing files into Together is most easily achieved as a drag and drop operation into the sidebar. Another way to add data is Together’s Shelf feature. The shelf appears as a tab on the edge of your screen and offers an unobtrusive way to toss something on the pile for dealing with later. Drag a file, some text, or a URL to the tab and a panel slides out allowing the item to be added to Together’s library without bringing the application forward. One can also click on the Shelf tab and type in a quick note. When you close the Shelf, Together creates a time-stamped note in the library with your text. Together will accept just about anything you drop on it, which is pretty handy, but not without pitfalls. Drop a terabyte drive on the library and Together will copy the drive’s contents into its database. Turning to more manageable data, Together recognizes images, audio, video, bookmarks and Web pages. It also has a Notes category for rich text notes created from within the application. Everything else gets lumped in the Documents category. I found Together’s Web page handling particularly compelling. When adding a Web page to the library, Together can create a Web archive that preserves the original components of the page or store a self-contained PDF image of it, preserving the links. Together can also just store just the URL as a bookmark. The only issue I experienced with saving Web pages is some annoying flickering of images as Web archives loaded. Files in the Documents category generally appear as icons in Together’s content pane, but if the file supports Leopard’s Quick Look feature, you’ll see its contents. Once you’ve loaded up your library, Together offers copious organization methods. Color-coded labels, much like the Finder’s familiar seven colors are available. There is no limit to the number of labels you can create in Together, and each label’s color can be customized. In a new install of Together, the pop-up menu for selecting a label only shows “No Label.” I had to find the Label Editor in the menu bar and create a few labels first. A few example labels and an “Edit Labels” item in the pop-up menu would avert that hassle. Text over a label is always black, so don’t bother with dark label colors. A second way to organize information is the use of tags. A tag is simply a one- or two- word description that characterizes a given item in the library. Tags are created by simply typing in the Tags box. Together memorizes the tags you create so you needn’t re-type the whole tag every time. Having rated, labeled, and tagged your items, you can sort them into Groups. Revisiting that iTunes metaphor, a Together Group is like a Playlist—it’s a collection of items from your Library. Drag and drop items on to a group’s icon to add them. I like how a Group can be configured to automatically apply certain tags to items as they’re added. With so many ways to categorize and organize information in Together, you should have no trouble telling your stuff apart. Smart Groups are another option. These groups self-populate based on user specified criteria. Anyone who has set up a Smart Album in iPhoto, Smart Playlist in iTunes, or Smart Folder in the Finder will be quite comfortable creating a Smart Group. If Together sounds a lot like Bare Bones Software’s Yojimbo 1.5 ( ) that’s because it is. The two products have similar user interfaces and feature sets. They also share the $39 price point. Together has a slightly longer feature list, but choosing between the two will primarily come down to individual preference. While not marquee features, Together does have some mention-worthy touches. Items added to the library can be copied into Together’s database leaving the original in place, moved into the database deleting the original file, or simply aliased. Importing happens in the background so you can continue to work with your existing items even as new ones are added. Together can synchronize between multiple Macs using Apple’s MobileMe ( ) service. Finally, Together can encrypt any given item to thwart wandering eyes. Together 2.2 excels as a repository for files and Web pages. It may not be your best choice for a note taker, but it’s a very capable note keeper. With so many ways to categorize and organize the items in a library, the only risk is becoming overwhelmed by the choices. Reinvented Software has done a bang-up job with the features and interface. Performance is generally good, though it sometimes hangs up briefly when loading a large item. All in all, Together makes a fine home for all your digital bits and pieces.